With previous opponent Joe Smith Jr. jumping ship to fight Artur Beterbiev, WBA light heavyweight champ Dmitry Bivol and his team were forced to look elsewhere for his next title defense. Good to see another last fight from HBO. Pascal is brave and still quick, but this is going to a very steep ask of him against Bivol, especially after Pascal’s last fight with the tough but limited mma fighter Steve Bosse. Not that I'm complaining but....... didn't HBO get out of boxing? I can see some competition brewing between HBO and Miles with his "I'm leaving" threads. Pascal needs to stop. He's already getting punchy. I don't see Bivol making mistakes under pressure from Pascal. Pascal might make it to then end but i think he gets clipped and pummeled till they stop it. He wont quit on his own. Yea I see Pascal either taking a beating into the final bell or a late mercy stoppage. Dmitry Bivol - Fighter of the year 2019! He's in a tough division and got the guys around him to make it so. Dmitry Bivol is punch perfect type of fighter love watching him box. I was high on Artur Beterbiev but I think Bivol is the best at the weight. They need a competition. To be honest, a competition would be great,but I reckon these guys will all end up fighting each other anyway. Bivol in current form is a recipe for brutal disaster for Pascal who needed a 1-0 ex mma fighter so he could shine last out. Poor guy is at the point where his legs pop and lock old street dance style at the hint of heavy punches. Though Bivol didn't exactly look like a trail blazing power house, almost disinterested at times, last time out v Chilemba and Pascal still has some fast hands very very early. That's about all he has left. Hbo last card is Chocolatito? much irony in that at this stage. Last edited by Spicoli; 11-15-2018 at 06:28 PM. Yea possibly, but it would be nice to have it basically set in stone like the WBSS. Honestly I think that LHW is the best weight to do it if everyone is on board. Bivol, Beterbiev, Alvarez, Stevenson, Gvozdyk, Kovalev, Jack, Yarde, Brown, Barrera, Smith. A few of those guys are already fighting each other or have fought each other (which is great for the division), but that division needs to see who the best really is. B-Hop Vs Jean Pascal Spoilers. 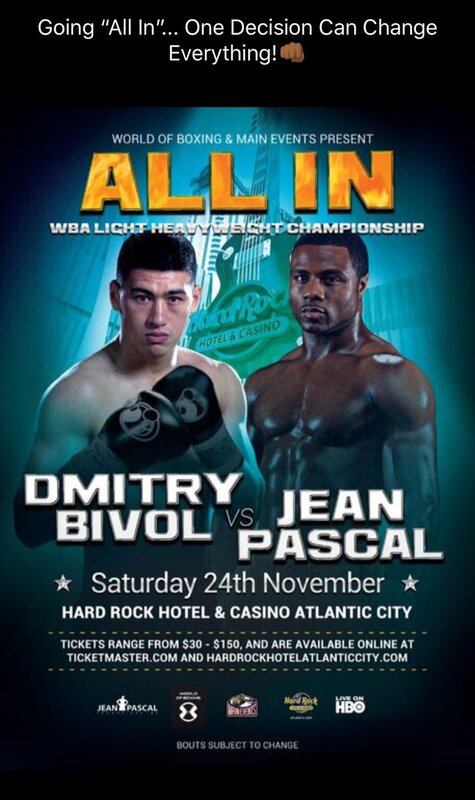 Anyone heard of Jean Pascal?